I am sorry to have to announce that, last night, CJ lost his brave fight. The infection in his abdomen was more widespread than the veterinarians had initially thought, and CJ was suffering. Karen, his dedicated foster mother, was with him when he left the world. I’m comforted to know that, at the very end of his life, CJ knew the love that he was denied for so much of the rest of it. CJ was Karen’s first foster dog, and the difference she made in his life is immense, as is the hole that he has left in hers. If you think of it, please write her a note of condolence. Our grateful thanks to everyone who donated towards CJ’s care since we reached out to you yesterday. Your donations will help to pay for the vet bills CJ accrued while his home veterinary team and the vets at Guelph searched for a way to save his life. Like everyone else who was touched by CJ, it is tempting to meditate on the cruelty that was done to him. We lost volunteers over CJ’s story, good people who are just too burned out on the seemingly non stop stories of sadness and misery and plain, banal evil that rescue work seems to expose us to every day. Instead, I’m going to choose to think of the people who reached out to him, and offered to help. You’re what matters, now more than ever. It’s trite to say, but sometimes, we really do need to light a candle and stand together against the dark. That’s CJ’s miracle, when you think about it. 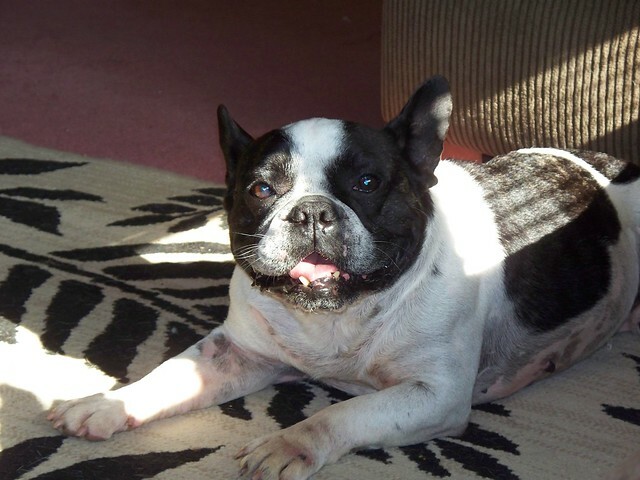 A list of all of CJ’s supporters will be posted, with gratitude, on the French Bulldog Village and ECFBC websites. My heart breaks for everyone involved, especially CJ. He was a beautiful boy and it boggles my mind that anyone could be cruel to such an innocent creature. My prayers are with Karen, and I hope she is comforted in the knowledge that for a short time CJ was probably never happier than when he was with her. I give her and all other fosters so much credit, I don’t think I could handle being a foster, it takes someone so special to fill that role. Know that CJ’s story didn’t push me away, instead when I get paid count on a donation from me to help ease the bills. It may not be much but I know every little bit helps. God speed CJ. Poor valiant boy! I’ll remember how happy he was when I picked him up after his neuter. He ran full tilt, slipping and sliding and bouncing back up after his legs failed him. He was always happy and exuberant! Thanks for caring for him. My husband and I are happy to have been there to pick him up and pass him on to his foster Mom, so he could be loved, if even for a short while! Farewell, funny boy!! I am so very sorry that CJ did not make it. I wish peace to the hearts of the people who worked so very hard to save him and who loved him so deeply if too briefly. I am so sorry for your loss. I can’t even imagine. Dear Karen, thank you very much for showing CJ what love and care means. Unfortunately he could taste it for only short time. Thank you again. Foster parent Eva Skaloud & beloved Boston Terrier Carmen. How very very sad…..at least he knew love before he went. Bless everyone who took him in and showed him what love & attention felt like! I have a boy who is a spitting image of CJ and just cannot imagine anyone being cruel to him. More so, how could one??? They are nothing but happy guys that are happy when you’re happy so how does this happen? My heart just aches for your loss, it really does. Know that you gave him what he was looking for his whole life and that he finally got what he deserved. RIP big guy and suffer no more. Such sad news. I’m glad his last days were filled with goodness of the rescue people involved. It just doesn’t seem fair sometimes. We are all on this earth to both teach, and learn: CJ taught us what was important in life; it wasn’t the big things, but the little ones. True happiness can be found with a soft place to lay your head at night and someone warm to curl up with on a quiet fall evening. We hope he learned from us the meaning of family and belonging, and that for every cruel, sadistic heart there is a warm, open one. It is said that if your life touches someone’s heart and your name is on someone’s lips, you can live forever. On 13 October 2010: CJ passed from our arms to the arms of angels, he had a name. Poor CJ, I am gratefull that you knew what it was like to truely be loved at the end of your life, God has one lucky boy in you, smile your big smile down upon us from heaven. Run and play and be happy like a proper Frenchie with all those who have gone before you. Lay down and snuggle close to your companions up there, they will know how to comfort you. Everyone, please hold your Frenchies close, we never know what tomorrow might bring, make them smile and feel loved while we can.